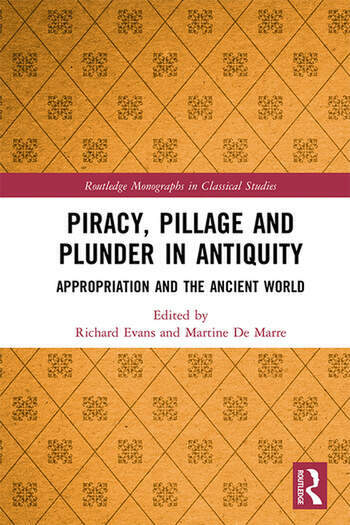 Piracy, Pillage, and Plunder in Antiquity explores appropriation in its broadest terns in the ancient world, from brigands, mercenaries and state-sponsored "piracy", to literary appropriation and the modern plundering of antiquities. The chronological extent of the studies in this volume, written by an international group of experts, ranges from about 2000 BCE to the 20th century. The geographical spectrum in similarly diverse, encompassing Africa, the Mediterranean, and Mesopotamia, allowing readers to track this phenomenon in various different manifestations. Predatory behaviour is a phenomenon seen in all walks of life. While violence may often be concomitant it is worth observing that predation can be extremely nuanced in its application, and it is precisely this gradation and its focus that occupies the essential issue in this volume. Piracy, Pillage, and Plunder in Antiquity will be of great interest to those studying a range of topics in antiquity, including literature and art, cities and their foundations, crime, warfare, and geography. Campaigning against Pirate Mercenaries: A Very Roman Strategy? Richard Evans has taught at the University of South Africa, Pretoria, and at Cardiff University, UK. Most recently he has been a Visiting Researcher and Research Fellow in the Department of Biblical and Ancient Studies at the University of South Africa. He is the author of a number of monographs, of which the most recent are Fields of Death: Retracing Ancient Battlefields (2013); Fields of Battle: Retracing Ancient Battlefields (2015); Ancient Syracuse: From Foundation to Fourth century Collapse (2016). He has also edited Mass and Elite in the Greek and Roman Worlds: From Sparta to Late Antiquity (2017). He is currently an Academic Associate at the University of South Africa. Martine De Marre is an Associate Professor of Ancient History in the Department of Biblical and Ancient Studies at the University of South Africa. Her research to date has focussed on social and cultural history of Roman North Africa during the entire period of antiquity up to the wars of Justinian, particularly in interpreting the role of women. The latter has also been the focus of studies on the literary sources of Late Antiquity, such as the works of Augustine, Fulgentius and Corippus.